Any review of a book by Whitney Balliett must certainly be as much about the writer himself as about his subject. Self-described as “an impressionist,” no writer or critic of jazz ever approached the work in a way even vaguely resembling Balliett’s prose writing. For me, his writing was like very, very rich chocolate cake that one savors, but only in small portions. It’s delicious in the moment, but one must soon put down the fork. Or, in this case, the book. Whitney Balliett was born in 1926 and died in February, 2007. He attended Phillips Exeter Academy, later earning a Bachelor’s degree at Cornell University in 1951. He took a job at The New Yorker in 1954, where during a 47-year stint there, he wrote more than 550 signed articles and many anonymous ones, including short articles for the magazine’s “Talk of the Town” section as well as book, film and theater reviews, and his famous profiles. He also wrote poetry. Collections of his New Yorker writings were published frequently over the years. His books included American Singers and American Musicians, the latter a collection of 56 of his profiles of jazz musicians. The later book, American Musicians II, was essentially a reissue of the earlier one but with 15 added profiles. His sweep was broad. 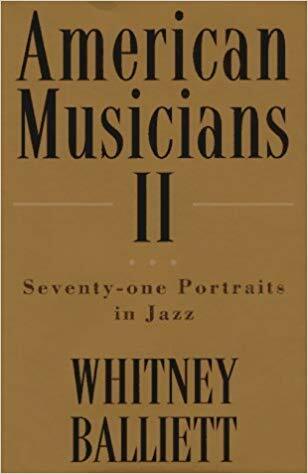 Balliett’s early portraits were of the musicians of the older generation — Pee Wee Russell (“Even his feet looked sad”), Sidney Catlett (“[He] was nobly constructed. He was six feet three or four inches tall and everything was in proportion: the massive shoulders, the long arms, the giant tapering fingers, the cannonball fists, the barn door chest and the tiny waist and columnar neck.”), Red Allen, Earl Hines, Art Tatum, Coleman Hawkins, Jack Teagarden, Zoot Sims, and Dave Tough. Later, he offered us his insightful impressions of Duke Ellington and Charles Mingus, Jim Hall (“He is slim and of medium height, and most of his hair is gone. The features of his long, pale face are chastely proportioned and are accented by a recently cultivated RAF mustache. He wears old-style gold rimmed spectacles, and he has three principal expressions: a wide smile, a child’s frown, and a calm, pleased playing mask. Eyes closed, chin slightly lifted and mouth ajar, he could easily be the affable son of the stony-faced farmer in ‘American Gothic.’”), Red Norvo, Ornette Coleman, Buddy Rich, Elvin Jones, Art Farmer, Michael Moore, and Tommy Flanagan. While Balliett takes us into the very heart and soul of the music, he offers what might well be considered a history of American jazz, one musician at a time.